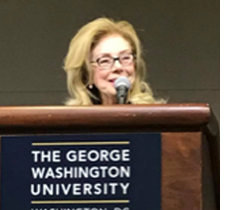 Omega World Travel’s President and CEO, Gloria Bohan, addressed George Washington University’s colloquium entitled “Politics of Tourism” last week. She spoke to the attendees about the history of Omega, and how she was able to build a business from a small leisure agency in Fredericksburg, Virginia with just one employee into the largest woman-owned travel company with offices around the world. Bohan explained that a large part of her ability to adapt her business in the Greater Washington area was her opportunity to work with the Federal Government. Omega won one of the first government awards for travel management in 1982 and has been a pioneer in the sector ever since. Bohan described how she was able to evolve her business through changing times and encouraged students to “think outside the box” when pursuing their careers as well. She highlighted the many opportunities for careers in the travel industry within Greater Washington; 13% of DC area jobs are attributed to the travel and tourism sector. The proceeding panel focused on the US Travel Association and represented destinations’ perspectives on economic development opportunities derived from travel and tourism. Panelists included: Carla Campos, Acting Executive Director of the Puerto Rico Tourism Authority; Ed Hall III, Tourism Coordinator of the Bureau of Indian Affairs; and Erik Hansen, Vice President of Government Relations of the US Travel Association. While discussing the impact of our country’s current political environment on international travel, Hansen stated that the best way to alter any negative perceptions of our country is to highlight who we really are through tourism. If foreign citizens come to the US and see our cities, our national parks, and our other attractions and really interact with the local population, then they can form a more realistic view of our country; we can change their opinions when given the opportunity. Campos has been active in helping rebuild Puerto Rico after the hurricanes that devastated the island last year. The silver lining of the damage done, she explained, is that now everyone knows where Puerto Rico is. They now know that it is a US territory, meaning they do not need a passport to get there or have to deal with going through customs. Her next step is marketing the island as a tourist destination; the best way people can help Puerto Rico rebuild is to go spend money within their economy. Shop in their stores, stay in their hotels, and tour their attractions. Hall works to facilitate relationships between government agencies and Native American tribes. When describing the relationship between natives and other citizens, he explained the key role that their history plays. “History has been written about us, not by us,” Hall stated. The Native American Tourism and Improving Visitor Experience (NATIVE) Act helped them start the difficult conversation regarding their culture and the important stories they have to tell. Though there was a trend to diminish the tribal footprint in the 1970’s and 80’s, that has been reversed. Their culture, he said, is worthy of sharing, and he feels that for the first time, others can appreciate their culture. Once the panel concluded, Senator Brian Schatz discussed how tourism affects his home state, Hawaii, and how politics can impact tourism. “People are searching for authentic experiences,” he stated. He described the “aloha spirit” and how it is an experience like no other. Fifty years ago, the “Big Island” saw high levels of tourism where there was nice weather, but the rainy side of the island was struggling. Locals then started the Merrie Monarch Festival, an event that showcases the art of hula; this resulted in a drastic increase in both the number of visitors and local pride. Tourism saved the economy, therefore saving their culture; if there is not a strong enough economy to support the locals, they cannot continue their art. Schatz stated, "Communities should have a bigger say in how their stories are shared." This belief was the foundation of the NATIVE Act, which he introduced in 2016 with Senator Thune (R, South Dakota), and the Explore America Act of 2018, which he sponsors with Senators Cassidy (R, Louisiana) and Reed (D, Rhode Island). This Act, which focuses on expanding heritage tourism, will strengthen the Preserve America Grant Program. Proposed amendments include: technical assistance from the Department of Commerce and Interior and the Advisory Council on Historic Preservation (ACHP) in lieu of monetary funds, coordination between the Secretary of Commerce and Secretary of the Interior and the ACHP to evaluate how the program can boost economic growth, added program metrics to increase accountability, and increased coordination with gateway communities. When asked about her participation in this event, Gloria Bohan stated, "I appreciate the great work done by George Washington University's Tourism Council and their outstanding educators in bringing together key players who have the goals of furthering tourism within the United States." Omega is headquartered in the Greater Washington area and stands ready to participate in the mission.